Last Sunday, this postcard from PostSecret was posted and I thought it was particularly insightful. 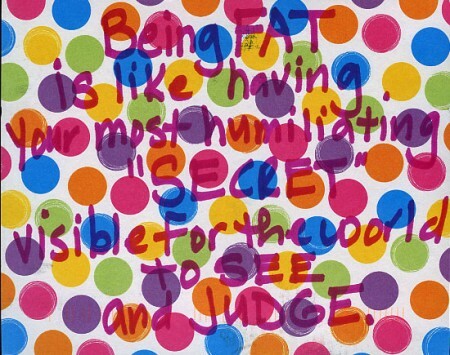 Being FAT is like having your most humiliating “SECRET” visible for the world to SEE and JUDGE. It’s true. For years, I’ve assumed that I can’t hide the fact that I’m fat, so I’m not going to try to mask it with black clothing or by limiting the styles of clothing I let myself wear. What is more humiliating? Being fat or being fat in a pair of comfortable shorts? They’re BOTH humiliating, so I decided LONG ago that I was still going to wear shorts and mini-skirts because I can’t HIDE it.